An article by our friends over at the Canadian Awareness Network. Read along with me now! "A 7.7 Earthquake hit the coast of British Columbia on Saturday night, and there has since been as many as 40 aftershocks today. Including one that measured 6.4 in magnitude. 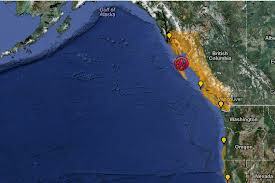 The quake sent many residents on the coast, fleeing for higher ground due to tsunami warnings. That where issued as far away as Hawaii. As soon as I caught the news of this quake today, the first thing that came to mind was. Wasn’t Haida Gwaii recently in the news? Worlds Largest Geoengineering Test Conducted Off Canadian West Coast“In July 2012 a private businessman named Russ George, or as the Vancouver Sun has dubbed him the “rogue climate hacker”. Dumped over 100 tonnes of iron into the pacific ocean, just off the coast of British Columbia (Haida Gwaii) in the largest ever geoengineering experiment. Continue Reading Could this be simply be a coincidence? Well as many in the alternative media have realized. Coincidences in situations like this are very, very rare. This type of situation would also be ideal for any private corporation of government in the chance of a disaster in result of a geoengineering experiment of that scale. It gives plausible deniability. Since this is in the area of an active fault line, there is no chance of proving that the experiment caused the earthquake."